Above: Trinity Church, which dates from 1725. 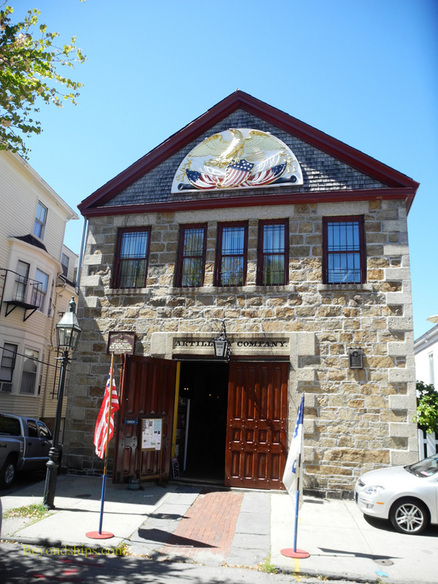 Not far from the waterfront, Newport has a bounty of historic buildings dating from the colonial era and the early years of the United States. So many that an entire 250 acre area in downtown Newport has been declared a historic district. Within that district are many buildings that have been designated National Historic Landmarks in their own right. The early American atmosphere created has led filmmakers to use the district as a set. For example, Stephen Spielberg filmed parts of "Amistad" here. Some of the landmark buildings in the historic district are open to the public. Others are still people's homes and/or businesses. However, it is pleasant just to walk the tree-shaded streets on a summer day and absorb the atmosphere. This page presents some of the buildings in the district. However, there are many more. 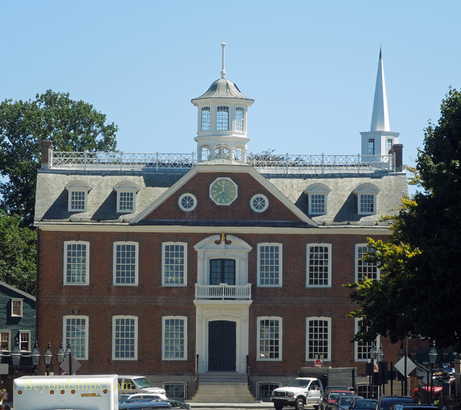 One of the most prominent structures in the historic district is the Colony House (also known as the Old State House.) It served as the capital building for the Rhode Island colony from its completion in 1741 until 1776 when the Declaration of Independence was read from its balcony. Not long after that a British army occupied Newport and it used the building was used as a barracks. Then when the French liberated the city from the British, it was used as a hospital. After the revolution, the building served as the state capital. However, Newport shared this role with the city of Providence, which had acted as the capital during the war. The Rhode Island Legislature continued to meet every other session in Newport until 1911 when a new capital building was completed in Providence. The Old Colony House is a National Historic Landmark. It is still owned by the state but is managed as a muesum by the Newport Historical Society. 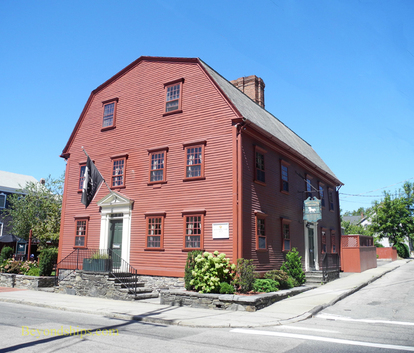 Newport boasts the oldest tavern in the United States. 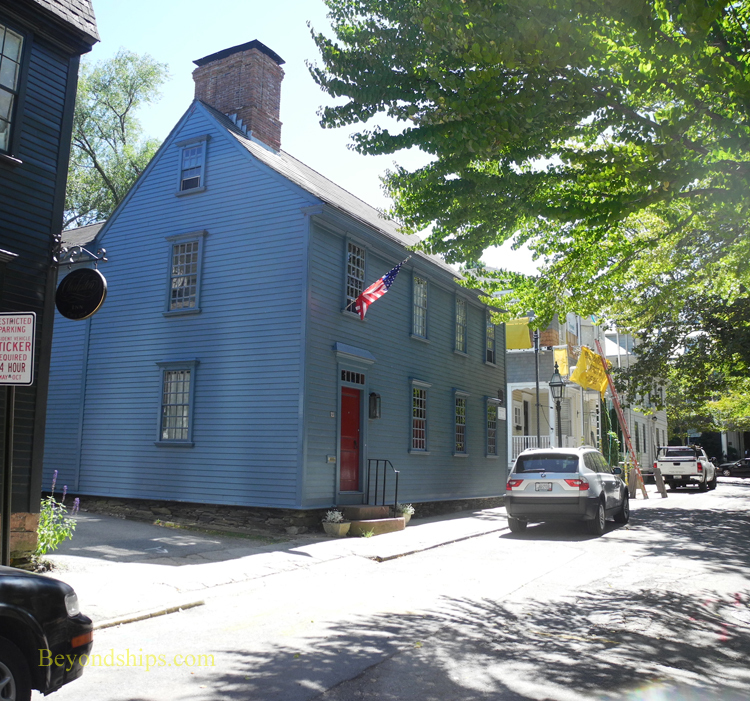 Built as a residence in 1652, this building was converted into a tavern in 1673. It also served as the meeting place for the colony's General Assembly and courts until the Colony House was built. In the early 18th century, the innkeeper William Maynes, Jr. was a notorious pirate but was well-liked and therefore, protected by the local population. During the American Revolution, Hessian mercenaries were quartered here. Afterwards, an enlarged tavern re-opened. In the late 19th century, the building became a boarding house and declined through the first half of the 20th century. It was rescued by the Preservation Society of Newport County, restored and then sold. Today, the White Horse Tavern continues to operate as a tavern. 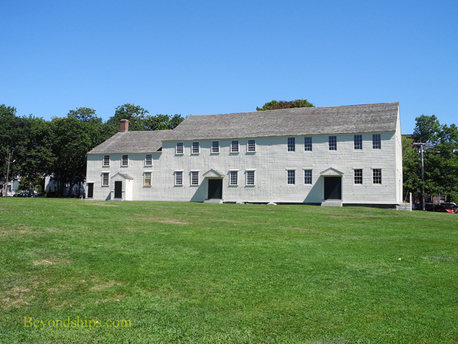 Across the street from the White Horse Tavern is a large grassy field on which sits the oldest place of worship in Rhode Island. The Rhode Island colony was founded on principles of religious freedom. Consequently, it attracted religious groups that were persecuted elsewhere. One of these was the Society of Friends, also known as Quakers. The Quakers came to dominate Newport politically, socially and economically in the 17th and 18th centuries. 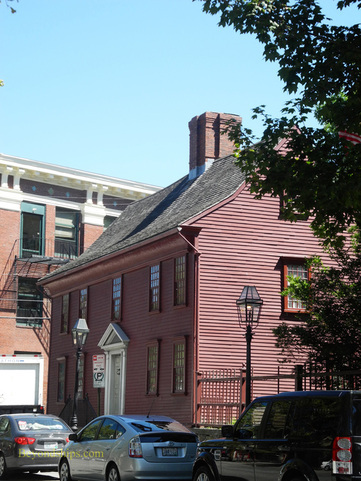 Consistent with this, their meeting house, built in 1699, was one of the largest buildings in Newport during this period. The wooden building is plain and without ornamentation reflecting Quaker attitudes. It is owned by the Newport Historical Society and is a National Historic Landmark. Rhode Island's policy of religious freedom also attracted Jewish immigration. The first 15 families arrived in Newport in 1658. A century later, both the city and its Jewish population had grown so that the congregation decided to build a permanent meeting place and place of worship. For this task, they commissioned Peter Harrison, a sea captain who was also a self-taught architect. Harrison also designed Newport's Redwood Library and the Brick Market as well as Boston's King's Chapel. The result was a beautiful Palladian-style building, which sits in its own nicely landscaped grounds. Adjacent to it is a museum telling the story of the synagogue and its congregation. Probably the most important event in the synagogue's history occurred just after the ratification of the American Constitution. 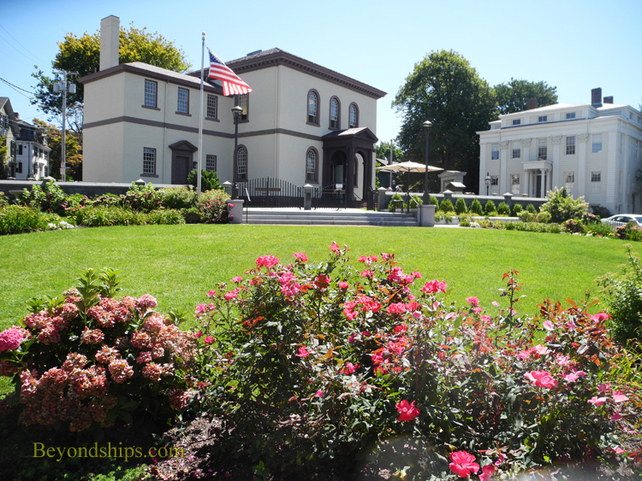 The first President, George Washington, was coming to Newport. Members of the congregation were concerned whether the new government would have the same tolerant attitude toward religion that the colonial government had had before the revolution. Therefore, in their welcoming letter to Washington, they raised the issue directly. Washington's letter in response is a landmark statement of the policy of the United States on religion: "It is now no more that toleration is spoken of as if it were the indulgence of one class of people that another enjoyed the exercise of their inherent natural rights, for, happily, the Government of the United States, which gives to bigotry no sanction, to persecution no assistance, requires only that they who live under its protection should demean themselves as good citizens in giving it on all occasions their effectual support." 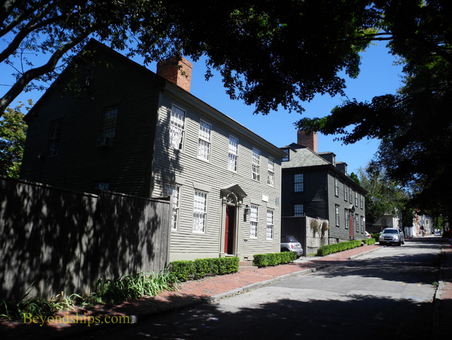 The Wanton-Lyman-Hazard House (left) is the oldest house in Newport. It was begun in the late 17th century and has been expanded over the years. In 1765 it was damaged during riots opposing the Stamp Act because it was owned by a loyalist who had published a pamphlet criticizing opponents of the Act. After the loyalist fled, the house was purchased by a Quaker merchant John Wanton. Subsequently, it passed to his son-in-law Daniel Lyman, a major in the American army, and then to another of Wanton's son-in-laws, Benjamin Hazard in 1807. It continued in the Hazrad family until 1911 after which it became derelict until the Newport Historical Society purchased it in 1927. Today, it is a National Historic Landmark. On Clarke Street is the home of the Artillery Company of Newport. First chartered in 1741, the Artillery Company served as a unit in conflicts ranging from the French and Indian War to World War I. Today, it is a ceremonial unit of the Chartered Commands of the Rhode Island Militia. Its building dates from 1828. It houses a museum that includes four cannons that were cast by Paul Revere as well as uniforms of several famous figures including Admiral Chester Nimitz, General Colin Powell, Lord Louis Mountbatten, and Prince Phillip. Just down the street from the Artillery Company building is a house that was the headquarters of the Comte de Rochambeau, commander of the French Army sent by King Louis XVI to aid the Americans in their revolution. George Washington stayed here and it is believed that he and Rochambeau developed strategic plans for the war here. The house is owned by the Newport Restoration Society and is a National Historic Landmark. Lying between the Artillery Company and Vernon House is a house dating to 1700. While the interior is 17th century, the exterior is done in an early 18th century style. Sitting atop a gentle slope rising up from the waterfront is Trinity Church. 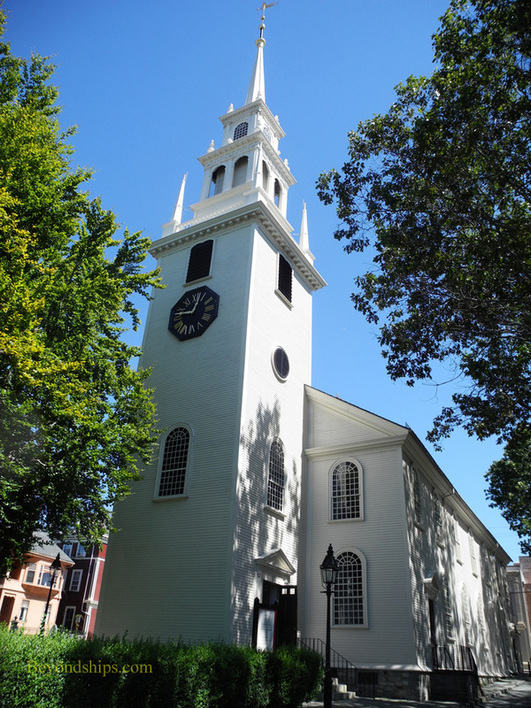 Begun in 1725, this episcopal church was designed by Richard Munday. Among those who have worshiped here are George Washington, Gilbert Stuart, Oliver Hazard Perry, Cornelius Vanderbilt II and John Jacob Astor VI. The church has appeared in three motion pictures. 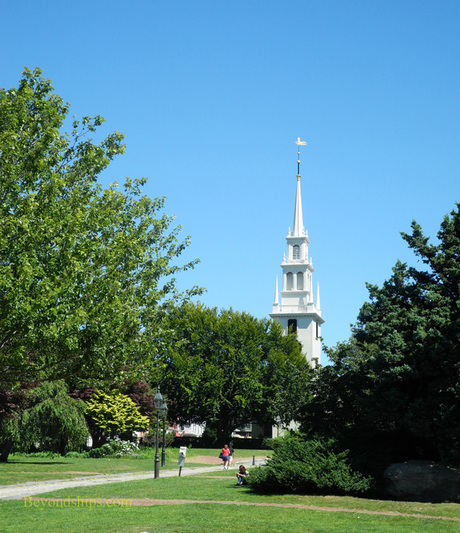 In front of the church is a grassy area that looks like a classic New England village green. However, Queen Anne's Square was actually created in the 20th century thanks to Doris Duke. The philanthropist removed buildings that were essentially urban blight and created the green area. 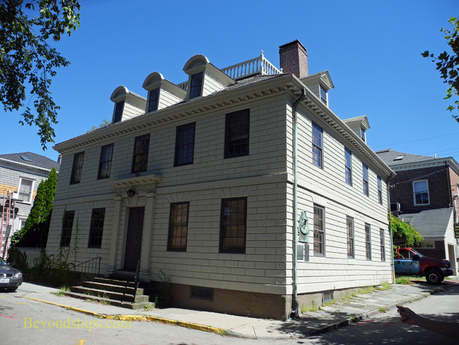 The Newport Restoration Foundation, which she founded, then moved some historic houses that were threatened with demolition to the streets around the square. A controversial project is underway to create a memorial to Ms. Duke in the square designed by Maya Lin.